This history of cream puffs reads like a mystery novel, leaving the chef to wonder "who done it?" Who invented this delicate puff pastry recipe is unknown, although chefs know the century in which this delectable desert was first mentioned in cookbooks and restaurant menus. Many cooks and pastry chefs passed recipes along by word of mouth. Recipes might be called one thing in France and another in England, one thing in the queen's kitchen and another in the mayor's. This makes it difficult to trace the history of cream puffs and mixes myth with fact. One myth surrounding the history of cream puffs is that they were invented by Catherine de Medici's cook. Catherine de Medici, daughter of the famous Renaissance Italy family of Medicis, was the queen of France. Legends surrounding the history of the cream puff credit Catherine's cook at the royal court of France with inventing this tasty dessert. Because Catherine was a patroness of the arts, many assume that her high taste in art ran to high art in the kitchen. Unfortunately, this myth is probably just that - a myth. While Catherine most certainly enjoyed delicate pastries, her cook did not invent puff pastries nor did he invent the cream puff. 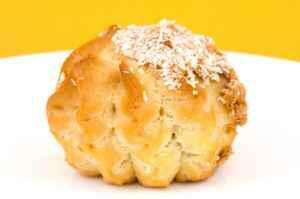 The ancestor of the cream puff can be traced back to the Middle Ages. Long before Catherine de Medici's cook set foot on French soil, cooks during the 13th century in southern Germany and France had created puff pastries filled with rich cheese mixtures. Pastry dough was cooked in a hot oven until it puffed, then sliced open and cheese inserted. The warm pastry melted the cheese center. Herbs were often added for additional flavoring. During the same time Catherine was queen in Renaissance France, pastry chefs throughout France and England had begun to experiment with dough mixtures of flour, water, fat and egg. The exact mixture goes by the name choux pastry. It's a simple mixture with delightful results: when it puffs, it creates an airy hole in the center which can be filled with sweet or savory filling. Recipes for cream buns called pate feuillettée in France and butter pasted puffs in England circulated from cook to cook by at least the early 1500's. These buns used the same basic dough of pastry flour, water, egg and fat. They were cooked into cakes about three or four inches long. After baking in the oven, they were removed and basted with a mixture of rosewater and sugar or lemon, rosewater and sugar and glued together to form a layered pastry. The entire pastry was then coated in another layer of sugar and lemon or rosewater flavoring. While not exactly resembling today's puffed and creamy delight, these desserts were much admired and sought after by the nobles and wealthy people of the day. They were an important step on the road to today's cream puff. The mystery of the true history of puffs deepens thanks to the many terms used to describe puffed pastry. While the basic four ingredient recipe remains the same, how the ingredients are prepared and baked led to many names - choux, puff, profiterole, and buns. By the 17th century, the pastry recipe was commonly referred to as a choux recipe, because the buns it made resembled cabbages. The French word for cabbage is choux. By the 19th century, the various types of puff pastries had developed their own following. Now each name took on distinctive meaning and characteristics. The dessert known and loved as the cream puff became known in pastry circles as the profiterole. There was still some leeway in the creation of the dessert. What you ordered in one French restaurant called a profiterole might taste very different than a similarly named dessert in England. By the mid 19th century in both France and England, the cream puff had become known as the profiterole. Often created in elaborate shapes by skilled pastry chefs, elegant Victorian diners could find cream puffs shaped like swans or pyramids of tiny, fragile chocolate or vanilla filled puffs to nibble on with the dessert wine, tea or coffee. In the United States, the first recorded mention of the cream puff on a restaurant menu dates to 1851 at the Revere House Restaurant in Boston. The humble cream puff had come a long way from the kitchens of the 13the century as a cheese-filled pastry to the darling of the Victorian dining room. What was once the purview of royalty now became a bakery aisle staple. You can even buy frozen cream puffs at most supermarkets. There's even a chain of cream puff bakeries called Beard Papa's, with 300 stores worldwide. But nothing beats the taste of a home baked, fresh from the oven puff pastry filled with sweet cream. Bite into one and imagine you're back at the French royal court, or sitting among the elegant diners at the Revere House Restaurant. Although the origins remain a mystery, the taste answers all questions: it's simply divine.